This Rosehip & Honey Anti-Aging Eye Treatment is perfect for dabbing around your eyes, on laugh lines, or other wrinkle prone spots. I actually use it as a full face, neck, and hand cream, but since it tends to start out feeling slightly sticky on the skin – you’ll probably only want to apply it at night. 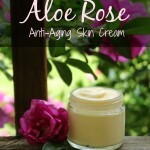 When you wake up in the morning, it will have left your skin soft, smooth, and silky! If you don’t have sweet almond oil, try using avocado, sunflower, jojoba, or another nourishing oil instead. Combine the beeswax and sweet almond oil in a heatproof jar (or upcycled tin can for easier cleanup). Set the jar, or can, down into a small saucepan containing a couple inches of water, to form a makeshift double boiler. You don’t want to ever melt beeswax in a container over direct heat, since it can be flammable that way. Once the beeswax has melted, remove from heat and allow to cool briefly. Add the honey and stir for one full minute. When adding honey to an otherwise oil based recipe, a lot of stirring is required, to keep it from beading out of your finished product. Next, add the rosehip seed oil. This should be added last because it’s a delicate oil, that should be stored in the refrigerator, and we don’t want to overheat it. You can also add lavender essential oil at this time, if you’d like. Stir thoroughly again and allow the mixture to sit until it starts to slightly thicken. Then, stir, stir, stir some more! The mixture will turn creamy and opaque. Spoon it into a glass jar. This recipe will fill a little over one of the 2-ounce glass jars shown. Cap and store in a cool, dry place. Shelf life is around 3 months, though you’ll probably use it up before then. Be sure not to get in your eyes as you apply. If you enjoyed this recipe, be sure to sign up for my newsletter HERE to get my best herbal projects, soap ideas, and DIY body care recipes sent straight to your inbox, once per month. Tagged anti-aging, honey, rosehip, wrinkles. Bookmark the permalink. 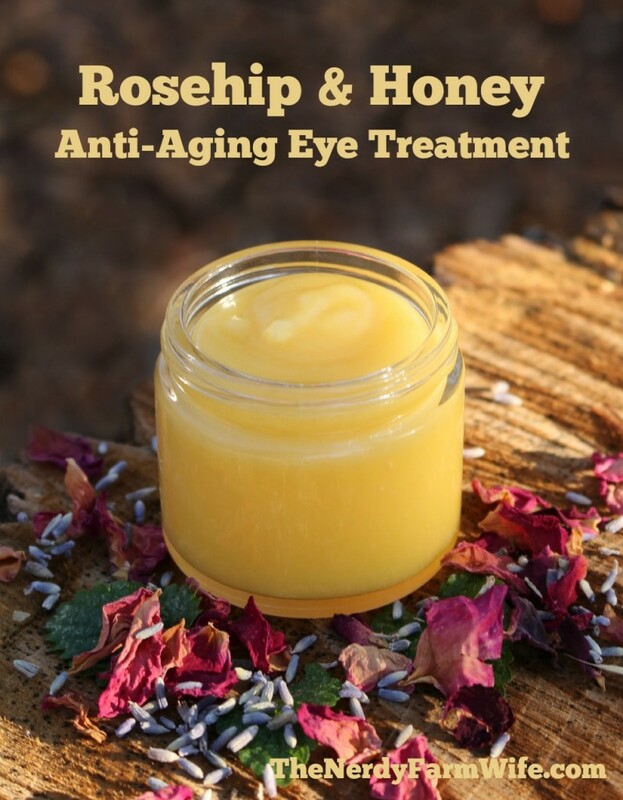 I would like to print your recipe of Rosehip & Honey Anti Aging Eye Treatment. Please let me know. Hi Kathleen, I need to make my site more print friendly (it’s on my goals for 2015 list!) But, I usually just copy and paste the information that I want from a web site into a plain word document and then print it that way. I’m sorry that it’s not easier to do at this time, but I will work on it over the coming year! There is a Google app called “Addtoany” that you can add to your toolbar (if you use Google) that will allow you to add a print function and when you click on it, you can then print any webpage. Thanks for sharing that helpful information Deitra! Hi, would it be possible to use a few drops of neroli in this recipe as I read that it is also good for large pores? Hi Lisa, I think that sounds like a good idea! 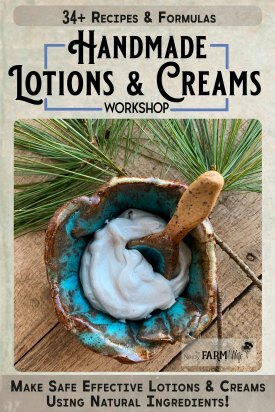 I’m new to the field of making your own DIY lotion, but excited to start! Question, how thick is the cream? Would I be able to put it into a wider mouth air pump bottle? Can I also add Vit E or a Vit C serum? Does this set up enough to put in chapstick tubes? It was just a thought. By the way, I love your website full of recipes and helpful hints. Looking forward to what you have for 2015. That is a really wonderful idea! You may have to add a little more beeswax, but if you don’t press too hard, it might just work in a tube. Thanks for sharing that great thought and for the kind words too! Any substitutes for the bees wax ? Hi. I am just making sure before I go ahead and do something wrong…. At the bottom of your site it says “All content on The Nerdy Farm Wife is Copyright…” This means obviously that I can’t just steal your words and put them on my own blog… but does this also mean that if I used your recipe I couldn’t sell the product? I’m loving your blog, the ingredients for your carrot and honey soap are in the mail to me now and I plan to make a batch next weekend. Just wondering, could I substitute meadowfoam seed oil for the sweet almond oil in this recipe? You stated the Rosehip Seed Oil was a delicate oil that should be stored in the refrigerator. Is this after opening or all the time? And should this cream be stored in the refrigerator? Looks like a great cream. Can’t wait to make and try it. Where can I get the raw honey? Hi Gail! Usually local farmer’s markets has some or you can call your county extension agency and they might have a list of beekeepers you could check with. Some health or grocery stores might have some too. You said this feels slightly sticky on the skin. Would arrowroot powder help with that? Hi Joy! You could test out a little bit and see. Probably dropping the amount of honey would help the most, but I just love how smooth honey makes my skin feel once it has all absorbed in. Would u be so kind to let me know if this cream is sticky since there is honey in it. I used creams with honey before and they tend to be a bit sticky… huge thank you..
Hi SisJane! Yes, you’re right, this cream does have a very slight sticky feel at first. It goes away once it sinks in though. You could leave the honey out, or try reducing it in half, if you’d like. I purchased some Hip seed oil a few months ago and its kept in a dark cool place.Will it go bad or loose its potency. This is the first time I’ve heard of refrigerating it. Thanks for recipe can’t wait to try it. Hi Rosalind! You can usually tell if an oil has gone bad by sniffing it. If it smells old and rancid, then it’s time to replace. Since you kept it in a cool, dark place it’s probably good to go! My house stays extra warm, so I have to refrigerate some of my more delicate oils to be sure they last as long as they should. 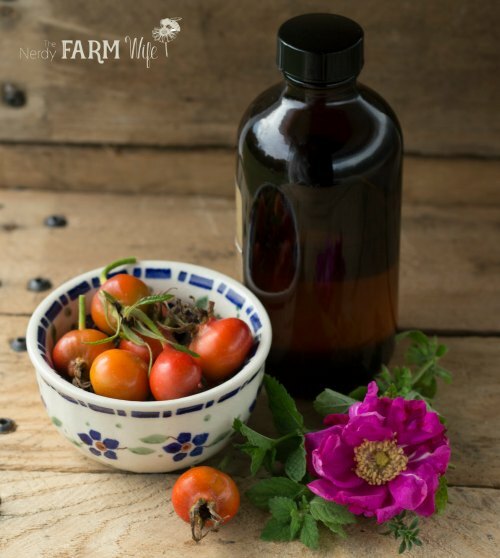 Have you ever thought of making your own Rosehip seed oil? I’m wondering if you could use any Rosehips (I have several rose bushes/shrubs)? Hi Karen, We had the same thought this week! :) I have some going right now that I’m experimenting with. I know it won’t be quite the same as the oil pressed from the seeds, but I dried the hips and am infusing them in some oil. (I used sweet almond oil for this experiment, but bet you can use all sorts of types.) I was afraid to use heat, so am doing it the slow, cool way which will take some time. I’ll be sure to update on the blog how it turns out! how do you measure the 2T of beeswax? Melt it first? My beeswax is in a large block. I suppose I could shave off 2T worth of flakes . . .
Hi; I was wondering why your recipes are not print friendly. Hi Merita! That’s something that I really want to get on my site soon. However, it involves downloading a special plugin for my site, then retyping up every single recipe – that’s a HUGE time commitment I just don’t have right now. Hopefully, once winter settles in and I’m indoors more, I can get to that! In the meantime, if you come across a recipe on a web site and you only want to print part of it, there are two ways you can do so. 1.) Highlight the text you’d like to print (by clicking your mouse’s left key and holding it down while you drag it over the words you want), then go to file -> print -> and in the print box, you should see where you can choose “selection”. That will only print the part you highlighted instead of everything. 2.) Highlight the text you’d like, then copy it by holding down CTRL and C at the same time (or command + C at the same time if you have a Mac) then go to Word or another word processing document and paste them into it by holding down CTRL and V at the same time (or if you have a Mac hit command and V). Then you can just print out the text from there. Hi Jan! I’m enjoying your website and recipes so much! Thank you do your time you put into this website. Could jojoba oil work as a substitute for sweet almond oil? Hi Rachael, So happy you enjoy the site and recipes! Yes, jojoba oil would make a wonderful substitute for the almond oil. Can I use this anti aging eye treatment on my face, coz I kind of lazy one! Hi Jan, love your site and all your recipes! Question: I have purchased some dried rosehips and am wondering if I can make an infused oil with them to then be used in facial recipes (infuse them into almond oil or jojoba, like you do with other herbs)? Would that work? Any other ideas as to what to do with dried rosehips? Thank you! Hi Cathy B! I tried making an infused oil with rosehips and they just sat there, like lumps. I did some reading and discovered that the hip itself is water soluble and won’t have the benefits that the oil pressed from the seeds will. 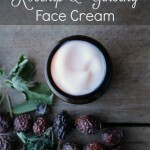 I thought about using rosehip tea in a lotion too, but haven’t tried that yet. Rosehips can be tinctured too. Hi Kay! You’ll definitely want to use this eye treatment at night, since it’s oil based it does take some time to soak in. You also want to apply very very lightly, just a thin layer will do. You might be happier with a water-based lotion or cream that will absorb in much quicker. Apparently I didn’t set up notifications for my comment and missed your reply. Thanks for the suggestions! I’m still using this at night and I do really like it. I have been eyeing up the other recipes you posted but I haven’t delved into emulsifying wax and preservatives yet. The preservatives are a bit intimidating with having to be a specific percentage of the product. But I really want to make my own magnesium body butter so I’m going to have to get over the preservative fear. I made some a few months ago that I loved and then I read your post on preservatives and how quickly they had growth. Since I made up my own recipe, I have no idea how to figure out how much preservative to put in it, so I haven’t bought any. Hi Kay! The preservatives are kind of intimidating at first; they were for me too. It makes it a lot easier if you convert your recipe from ounces to grams too. and then see what percent your preservative should be used at. Example, if it needs to be used at 4% (same as .04) you can take the amount of grams in your recipe and multiply it by .04. If your recipe totals 100 grams that would be 4 grams of preservative needed. If it’s an odd number like 124 grams of lotion, you would go 124 g x .04 = 4.96 which you would round to 5 grams of preservative needed. This is absolutely my favorite thing I make for my skin… I not only use it for a face & hand lotion, but I use it as a lip balm & for my dry elbows as well! I’ve been using it now for about two months on my face… There is a transition period (just like switching to any different facial cleansing regimen), but I’m finally at the other side, and this, along with a coconut oil face wash & an ACV toner, is finally making my skin clear and fading my scars after YEARS of acne. Thank you so much for sharing!!! How long should the mixture take to firm up in the last step? I used avocado oil instead. Hi Erin! It should firm fairly quickly, though it’ll stay on the slightly soft side – almost ointment-like. It’s been really hot weather here, so if that’s the case where you are too, it may just be the heat keeping it extra soft. You could try storing it in a cooler place and see if that helps! Hi Jan! Can I use Manuka Honey instead of Raw Honey for this recipe? Hi Tania! Yes, you sure can! Hi Kelly! I’m so glad that you enjoy the recipe! The only way I’ve found to help with that is a LOT of vigorous stirring. It’s best done while the mixture is cooling, but if it’s still stirrable texture, you could try vigorously stirring it again to see if that helps. Thank you so much for posting this-I can’t wait to try it! Question about the beeswax. I am working from a block. How many ounces are needed to equal two table spoons? Would it be roughly 1oz? Hi Patricia! Glad you like the recipe! 1 tablespoon of tightly packed grated beeswax is around 10 grams, so 2 tablespoons would be around 20 grams or 0.70 oz. 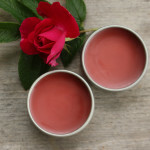 I love your eye cream recipe, but can I use soy wax instead of beeswax? I recently made some therapeutic candles using soy wax, and I have plenty of leftovers. Thanks for sharing! I’m a little concerned that the Almond oil might cause me to break out. Is there an alternative? *Thank you for all your wonderful tips and recipes! 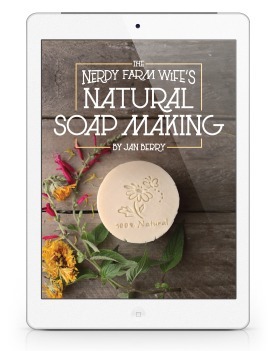 I have your book 101 Easy Homemade Products and am purchasing your book on soapmaking soon. Hi Camille! You could substitute the almond oil with most any other liquid oil that your skin does well with. I made this with local honey. I didn’t use raw honey as it has pollen granules in it that can irritate sensitive tissue under the eyes. It’s a fabulous recipe. I whipped it with a few drops of aloe juice…fabulous.